Spongebob Montage. 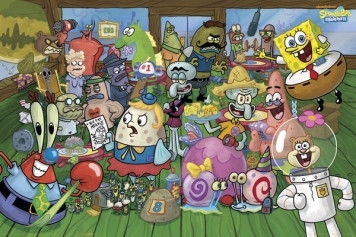 The cast and characters from Spongebob Squarepants. Wallpaper and background images in the SpongeBob SquarePants club tagged: spongebob spongebob squarepants squarepants nickelodeon patrick. This SpongeBob SquarePants photo contains anime, truyện tranh, phim hoạt hình, and manga. There might also be cửa sổ kính màu. Yay, the gangs all here! Well all of the group is here, isn't that awesome!